It was a monk named Kakushin at the Kokoku Temple in Kishu Yura (modern-day Hidaka District, Wakayama) who is said to have made what would eventually become soy sauce in Japan’s Kamakura period (1185-1333). When Kakushin was teaching how to produce the “Kinzanji” miso he learned in China to villagers of Kishu Yuasa, he made a mistake in the preparation, accidentally producing something similar to present-day “tamari” soy sauce (a thick, lightly salty soy sauce). 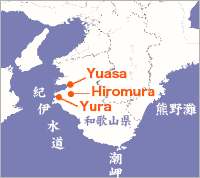 The founder of Yamasa Soy Sauce, Gihei Hamaguchi, was a native of Hiromura (present-day Hirogawa-cho), a village neighboring the birthplace of soy sauce — Kishu Yura. Generations of Hamaguchi family patriarchs have traveled back and forth between the family estate in Kishu Hiromura and Choshi. The original Gihei Hamaguchi came to Choshi from Kishu and started Yamasa Soy Sauce in 1645. It has been speculated that Hamaguchi began doing business in Choshi as the result of being motivated by a figure known as Sakiyama Jiroemon, a fellow Kishu native, who built the Choshi Togawa port and achieved major success with a new fishing method. Despite having a few ups and downs along the way, Yamasa Soy Sauce has continued to produce high-quality soy sauce for 12 generations over three and a half centuries since the company’s founding. At the same time, the town of Choshi possesses a climate similar to that of Kishu — the ideal place for producing soy sauce — and it would go on to develop into not only a fishing town, but also a town for soy sauce. The Tokugawa Shogunate government started in 1603, and ever since the defeat of the Toyotomi clan at the Summer Siege of Osaka in 1615, the center of culture and politics in Japan — both literally and figuratively — shifted to Edo (modern-day Tokyo). Yamasa Soy Sauce was founded just a short 42 years after the emergence of the Tokugawa Shogunate in Choshi located in Chiba Prefecture. Keeping pace with the growing town of Edo, Yamasa Soy Sauce would go on to contribute to the development of the culinary culture and has continued to provide people with the unique Japanese taste known as soy sauce.